Since it’s Christmas Eve and you don’t have lots of time to read…. Just for fun….Let’s take a look at some sweet red and white Christmas kitchen vignettes. My friend and I had a bit of fun arranging items in her lovely red and white kitchen for Christmas. 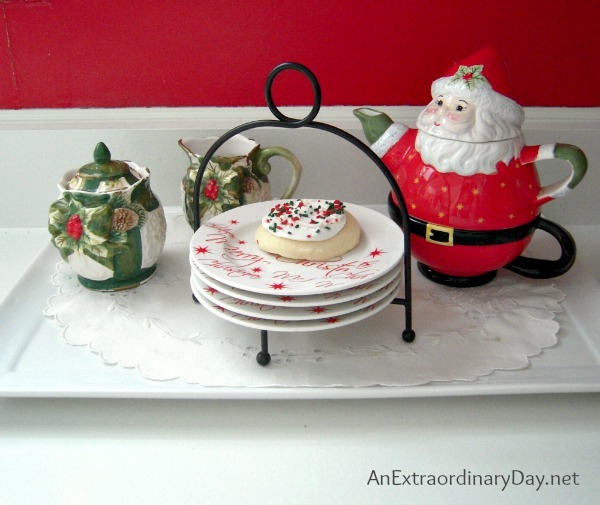 It would be so fun to have you over for some Christmas cookies and a cup of Christmas tea…. I love this old hutch combo. The upper cabinet originally came from an old New York post office and the bottom is a garage sale chest of drawers which my friend painted in just the sweetest way. My friend loves snowmen. I do too. And if you’ll notice the snowman with the blue top hat next to the tea cup…I gifted her that little guy for Christmas several years ago…as I also did the one with the basket at the top. Yes…even the window sills were dressed with snowmen and red and white pottery. Many of you know that red and white is my favorite color combo for Christmas decor. So yes…I enjoy cooking in this sweet kitchen. And just wouldn’t you expect one of my good friends to be crazy about the same color palette as me? As much as all of this is just so fun. The reason we decorate is to celebrate the birth of Jesus. Tonight we’ll be attending the Christmas Eve service at a nearby church. I’m looking forward to singing the carols and worshiping the ONE who lovesyou and me so much that he sent his only son as a helpless babe. That helpless babe grew up to become a sinless man who would die on the cross to pay the price for our sins, so that we would could be a part of God’s forever family. What a gift! What love!! What joy I have in receiving his gift. This is the best birthday party of the whole year! If you’re a business owner or blogger…I am now selling sidebar ads. Please contact me for a great introductory offer. your home in red and white is sooooo beautiful. I know what colour I am doing next year! My comment went away!! Thank you for your wonderful godly and fun posts and series. Merry Christmas. I too like the red and white!!!! WOW–the two of you went to the nth to make it festive and fun…..and since it’s a celebration, fun it is! Happy Christmas to you, your husband and the couple who’ve made their home, yours. And I echo what’s shared from those before me–thank you….for the inspiration, for the dedication and perseverance and for the love you extend to all of us here. It’s all of those things that make HERE a Joyful, Extraordinary place to visit…..every time. Love love your red kitchen! Just now have a day to look on the second day of Chirstmas! Merry Christmas! Love it all especially that cabinet!